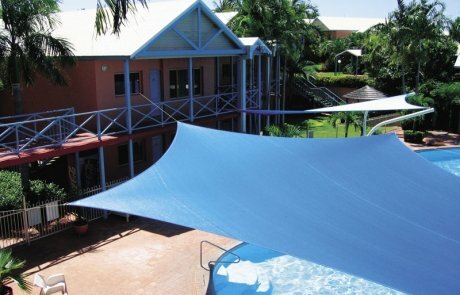 Shadesails made from Polytex ® are ideal to protect people from the sun around leisure areas and swimming pools. 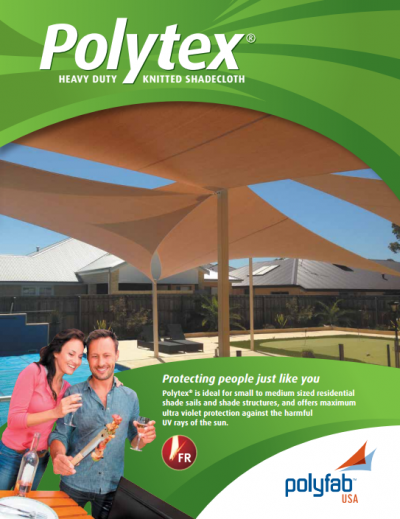 Polytex ® can be used around beach entertainment and barbecue facilities, outdoor leisure and picnic areas. 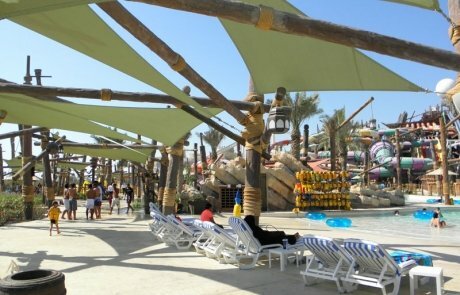 Other applications include playgrounds, preschools, secondary schools, camping grounds, hotels, motels and holiday resorts. 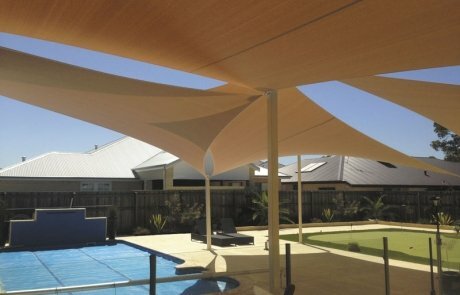 Shadesails made from Polytex ® also offer a striking alternative to flat roof timber pergolas and can be designed to accentuate any location, whether it be a home, garden or commercial establishment. Polytex ® provides maximum people protection against the sun’s heat and strong Ultra Violet (UV) rays and utilizes the best UV stabilizers from BASF. It also provides good protection against wind, rain and hail. Polytex® is made to comply with and exceed AU standard AS4174.1994. 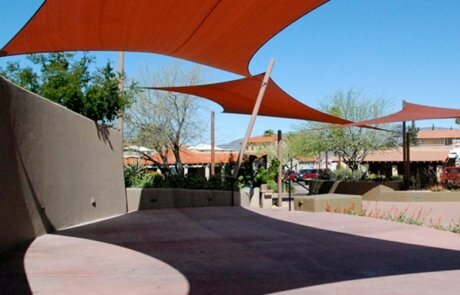 POLYTEX® and COMTEX® EXTRA HEAVY DUTY KNITTED SHADECLOTH (“fabric”) are premium fabrics designed for use in shade structures and shade sails. POLYFAB UNDERTAKES NO RESPONSIBILITY FOR THE QUALITY OF THE FABRIC EXCEPT AS OTHERWISE PROVIDED HEREIN. THERE IS NO IMPLIED WARRANTY THAT THE FABRIC SHALL BE MERCHANTABLE. POLYFAB ASSUMES NO RESPONSIBILITY THAT THE FABRIC WILL BE FIT FOR ANY PARTICULAR PURPOSE FOR WHICH YOU MAY BE BUYING THE FABRIC, EXCEPT AS OTHERWISE PROVIDED HEREIN. THERE IS NO IMPLIED WARRANTY THAT THE FABRIC SHALL BE FIT FOR ANY PARTICULAR PURPOSE. YOU ACKNOWLEDGE THAT YOU ARE NOT RELYING ON POLYFAB’S SKILL OR JUDGMENT TO SELECT OR FURNISH THE FABRIC SUITABLE FOR ANY PARTICULAR PURPOSE AND THAT THERE IS NO WARRANTY WHICH EXTENDS BEYOND THAT PROVIDED HEREIN. • Exposure to pollution, chemicals, solvents, cleaning agents or other substances that are harmful to the performance of the fabric. • Faulty installation of the fabric or faulty design or manufacture of any structure to which the fabric is attached. • Improper storing, handling, bracing, use of the fabric or use contrary to the specifications for the fabric. • Color fading. Color fading is normal over time. Fabric colors containing red or yellow pigments have a tendency to fade more than others. Color Fading is not abnormal deterioration or a loss of strength/breakdown and is not covered by this warranty. • Minor color variation from fabric samples. • Minor visual imperfection due to the manufacturing processes. • The negligent act or omission of any person. • Misuse, neglect or abuse of the fabric. • During installation, the fabric should not be subject to “pre-stressed” loading in excess of 20%. 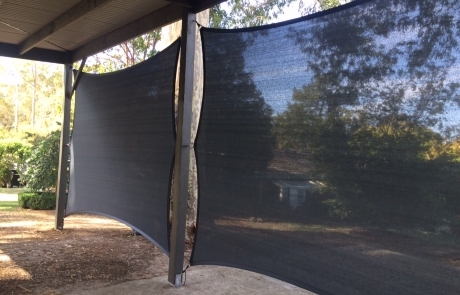 • Wind flap and storm damages are major causes of abnormal deterioration and premature breakdown in any quality outdoor fabric. It is therefore critical that the fabric be installed firm and tight and maintained in a firm condition. 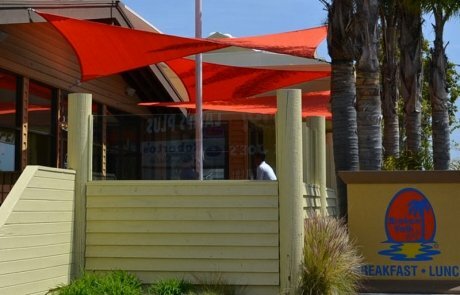 Fabric that is allowed to flap and cause rubbing and abrasion as a result of excessive and continual wind flap or storm damage on structural poles and support wires is mechanical breakdown and not covered by this warranty. 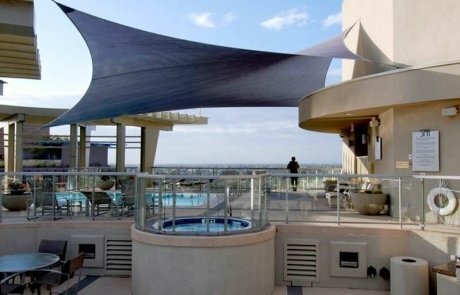 • The fabric should be supported by using appropriate strength poles and footings as determined by a professional structural engineer, and fabricated and installed by a qualified contractor in accordance with local building codes. 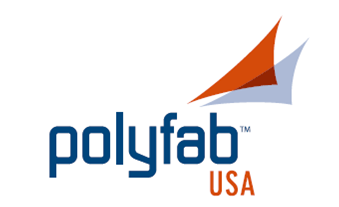 • Technical testing information supplied by Polyfab is sourced from third-party testing authorities, and tolerances may vary by as much as 10%. Polyfab’s obligations and liabilities are expressly and exclusively limited to those set forth herein. EXCEPT AS OTHERWISE PROVIDED FOR HEREIN, POLYFAB SHALL NOT BE LIABLE FOR DIRECT, INDIRECT, INCIDENTAL, CONSEQUENTIAL, OR SPECIAL DAMAGES, INCLUDING LOSS OF PROFITS OR OTHER COMMERCIAL LOSSES, INCLUDING CLAIMS BASED ON NEGLIGENCE OR STRICT LIABILITY. IN THE EVENT POLYFAB IS FOUND TO BE LIABLE FOR ANY DAMAGE OR LOSS RELATED TO THE FABRIC, SUCH LIABILITY SHALL BE LIMITED TO THE ORIGINAL PURCHASE PRICE OF THE FABRIC. All claims under this limited warranty must be made in writing, within 30 days from the date upon which the defect became known to the initial purchaser, to Polyfab USA LLC, 1601 N. Sepulveda Blvd. #392, Manhattan Beach, CA 90266. Claims must be supported by a sample of the defective fabric together with proof of purchase, including the date and location of fabric purchase, and photos of the finished installation. 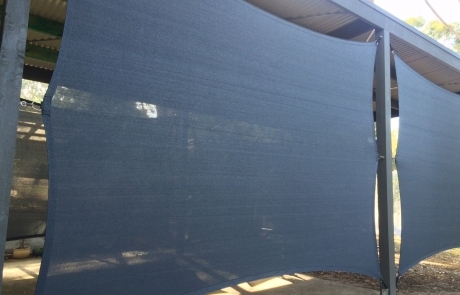 Heavy Duty Shadecloth is an Industrial Textile made from High Density Polyethylene, and combines Ultra Violet (UV) stabilizers and color additives. During the manufacturing process imperfections may occur. 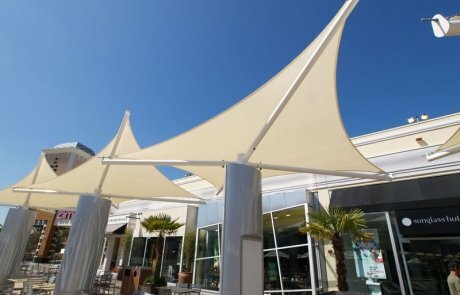 These imperfections are cosmetic only, and will not impact or interfere with the performance of the life of the shade fabric or the function for which it has been designed. 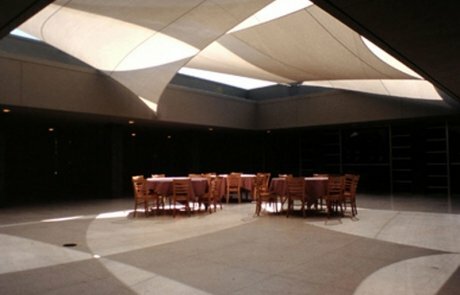 The knitted Shade Sail, should be installed by a company or individual that has received accreditation by the Building Commission, or Building Association, or other recognized building authorities in your state. If unsure please check with your State Building Authorities and your local Council. 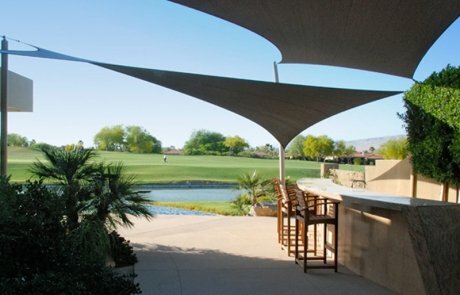 Your shade sail canopy should be installed firm and tight so as to reduce windflap in the shade fabric. 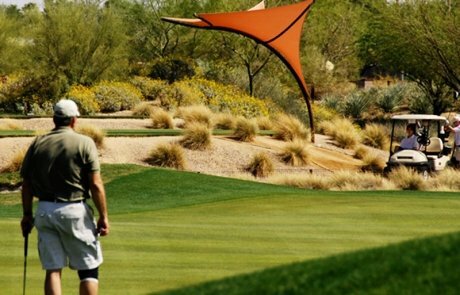 Shade fabric that is loose and sloppy will cause premature failure due to mechanical breakdown. This is not UV breakdown and is not covered by the warranty. 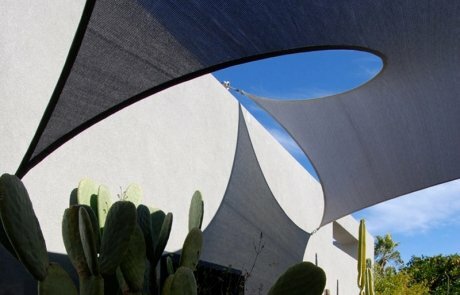 The shade sail will require periodic maintenance to ensure that the shadecloth fabric remains tight. 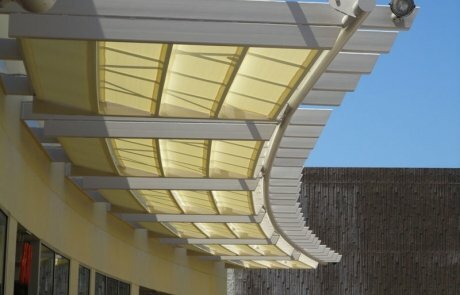 Your shadecloth canopy may become dirty over time. Care should be taken to avoid Chemicals that may contain Bleach, or other agricultural or industrial Chemicals containing Sulphur and or Halogens (chlorine Bromine). 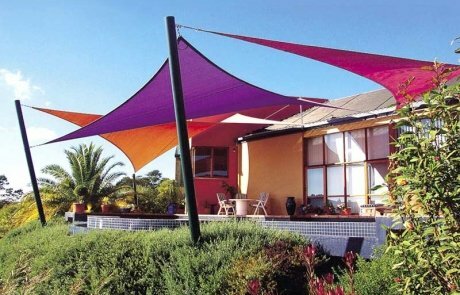 These Chemicals may attack the UV stabilizers within the Shadecloth, thus reducing the Life of the product and negating the warranty. The following list of chemicals that may cause such interactions are only some examples and not exhaustive. Such chemicals may include: pesticides, metals, metal oxides and metal salts, all halogens and chemical compounds containing halogens or sulphur in all their oxidation states. Care should be taken to avoid exposure to petrol, oils etc. The fabric warranties do not pertain to such damage caused by storms, hailstorm, earthquake, mechanical damage done by birds or other animals, fire, lightening etc. Again this is not an exhaustive list and it is for reference only. 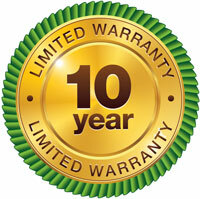 Please refer to our Product Warranty, for further information. If you remove the shade sail over winter, ensure that it is stored away from rats and mice, preferably stored in a protective bag.